We are almost finished working with a builder on a new home. The square footage is somewhere close to 7000 sq ft, complete with swimming pool and outdoor fireplace. In other words, there are a lot of details to think about, and that brings me to the dining room ceiling. Knowing the style of this home, we knew a big white ceiling would not fit in, and the rugged beams used in the hearth room wouldn't be appropriate for the clients more refined dining room set. This home's "Tuscan" design needed something unique for this vast area! Since the cabinetry is also done in knotty alder, it was decided to use the same wood as a paneled ceiling. 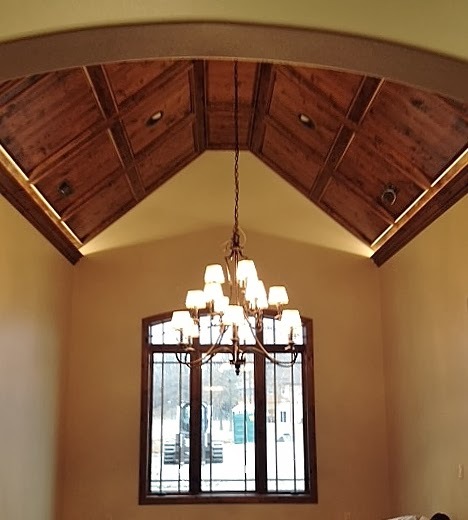 You can see in the closeup that the crown molding is hiding some lighting that gives a glow to the ceiling and will be a great way to light for those evening dinners. Here's a straight-on view from the living room into the dining room. There will eventually be window treatments and of course, the regular dining room furniture! But for now, we can admire the workmanship of the carpenter, and the builder who actually put the idea into action, and the homeowners who let us help decide the details of their lovely new home. Don't let the details of your new home overwhelm you! We can help you every step of the way. That is gorgeous!!! I can't wait to see what you do for window treatments!! Lucky clients to have you around! PS: the "water" candles are delicioso!! My friend came, sniffed and swiped one :^).